Starting today, I thought I'd occasionally treat you (and I use the word "treat" loosely) to some pictures from my archives. "My "archives" being my scrapbooks from high school. I know! You can't wait! Really, a more appropriate title for this series would be "A History of Katherine's Hair," because my poor hair saw more chemicals in that four-year period than most people's hair sees in a lifetime. 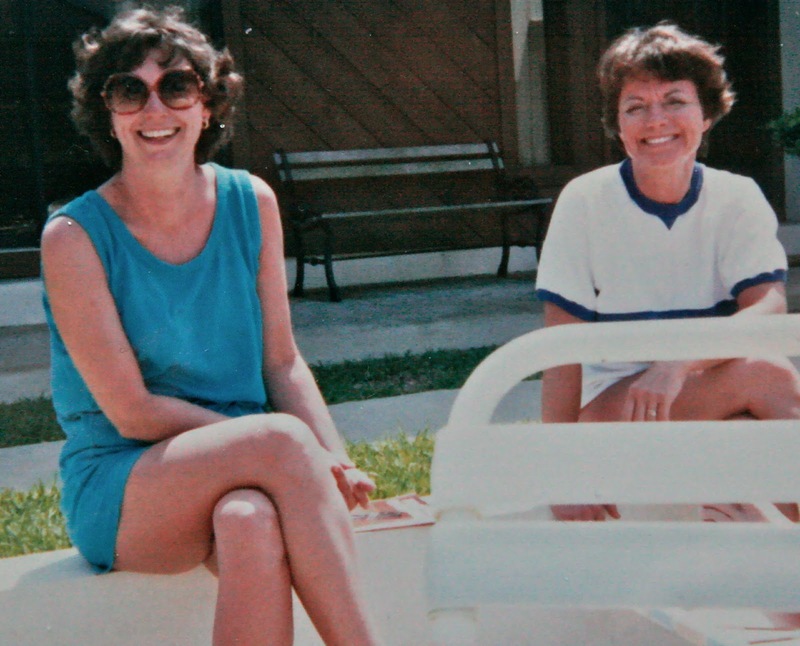 In high school, when I lived in Marietta, Ga., we used to vacation on the Gulf Coast. 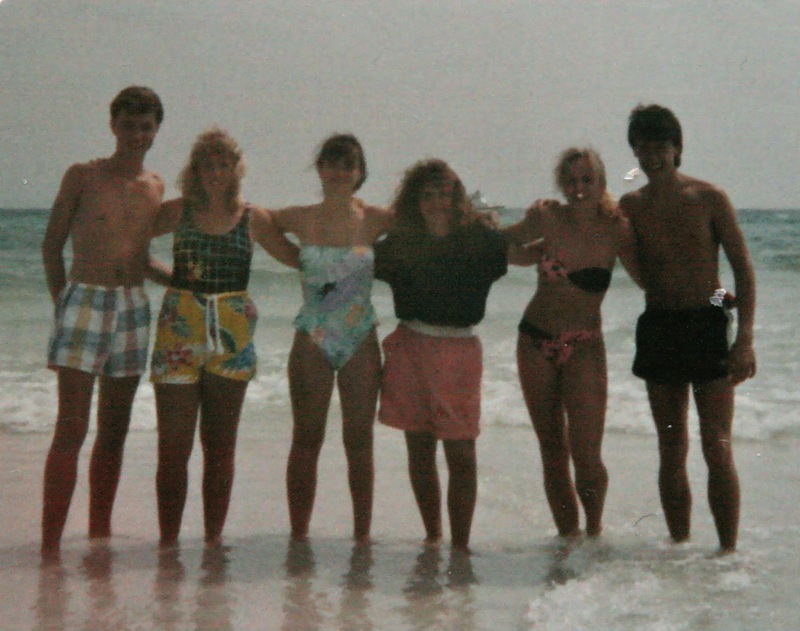 Spring Break 1988 took me to Destin, Fla., with my closest friends -- several members of my youth group and their parents. I really hate that the details of my hair are mostly obscured by the period detailing of the condo balcony behind me, because that's some big, curly hair going on there, considering how short it is. Also, please enjoy how I'm wearing a T-shirt over my swimsuit and covering myself up with my hands the best I can, even though I was a size 2. HIGH SCHOOL WAS A LOVELY TIME. My body-image issues knew no bounds, as is even more evident from the picture below, in which all of my friends and I are standing in the ocean but I am fully clothed. Don't ask. I have no idea. The only new addition to that picture is my friend Leslie, who you still hear me talk about from time to time because even though she lives in Atlanta, we still hang out. She comes to the weekend crops (she was just here for the one in January), and you may remember one of my most popular Home posts on painting checkerboard floors -- which we did in her kitchen. Usually women get mad at you for posting pictures of them in their swimsuits on the Internet, but I think she'll give me a pass. HER THIGHS AREN'T TOUCHING, FOR CRIPES' SAKE. The two sets of parents who chaperoned us on that trip were Leslie's and Brent's, and their moms are two of my favorite people on the planet, to this day. Delores, on the left, is just a dear, dear friend. And her birthday was this week! Hi, Delores! Happy belated birthday! You're on the Internet! Brent's mom Nancy, on the right, is possibly the most thoughtful person I know. She STILL sends me a birthday card through the U.S. Postal Service every year ... 26 years after we met. Amazing. Ooh. HERE'S a great shot of my triangle hair and Heather's Tall Bangs. We had a name for her bangs: The Waterfall. They really defied gravity ... it was amazing. Also? You might recall that Teal was in in 1988. The color teal and also apparently shorts that were big enough to fit two of yourself in. I also hope that you absorbed the fact that I was wearing layered T-shirts, and I rolled the sleeves so that everyone could fully enjoy both colors. If the photographer had pulled back a SKITCH more, you'd be able to see that I was also wearing two pairs of socks, with one color peeking out over the other. Internet, please be advised that that makes your shoes REALLY tight. Lastly, I 'll leave you with a picture of the night my friends tried to teach me how to play Poker. With candy cigars, IBC Root Beer in bottles, and Starbursts for Poker chips. I didn't understand Poker that night, and I don't understand it now. Perhaps the power of my unwaxed eyebrows repelled any sort of Poker information from my brain. I hope I haven't scared you away forever. Because this was just the beginning, Internet. Shoulder-length hair, just a perm, no color. That summer, I discovered SUN-IN. Oh my goodness I miss the 80's. I wore 2 polo shirts with the collar standing up on both. Big hair was awesome!! Mine has never been too big and I am currently wearing the same hairstyle as back in high school. Thanks for sharing!